I am going to assume that this topic means authors whose books are great and need to me more widely read, not that the authors themselves need to be on E! or in OK! magazine more frequently. Several of the authors I will mention are very well-read in our Goodreads circles and by those “in the know.” I am including them here because I think the general public needs to ooh and aah over them more, not because I don’t think no one has heard of them. Heather Dixon. Maybe it’s because she’s only written one book (so far), and maybe it’s because I just finished said book…but it was awesome, and I think everyone should know about it. Be sure to check out Entwined, especially if you are a fan of magical historical-ish fairy tales that have royalty, evil, love, twists, turns and lots of dancing. I am really honored to be on your list, Audrey. Thank you! You’re so welcome, Trish. You know how much I love your writing! 69:07:13:15 and counting! Thanks for including me and beating my drum *. I’m keeping this list because I havent’ read any of those authors either! You’re the best fangirl an author could ever have! Thanks, Angel! I do my best! I love your list! If we could’ve had more than ten, Trish would have been on mine as well. Also love Heather Dixon and A.G. Howard. Seems like we have similar tastes! 🙂 Following you on Bloglovin, Facebook and Twitter now. Thanks! I just looked at your list…wow, 9 of the 10 I have NEVER heard of. 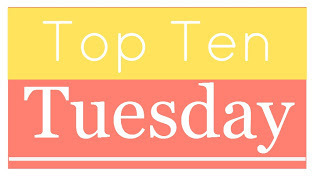 So, this was a very useful Top 10 for sure! Thanks for the comment & follows! I have reciprocated.